The No. 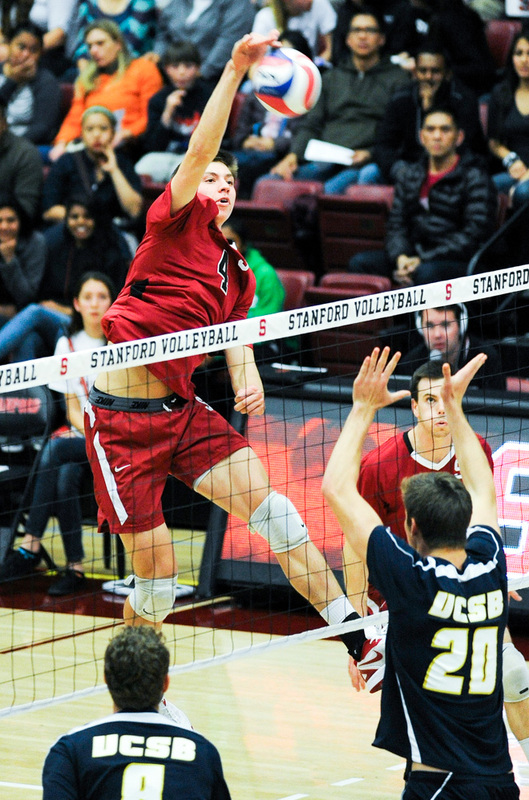 11 Stanford men’s volleyball team (2-0) went undefeated on the road this weekend, sweeping the then-No. 14 Ball State Cardinals on Friday and defeating the IPFW Mastodons in four sets on Saturday. Stanford out hit Ball State in all but one set and held the Cardinals to just a .033 clip in the first set. After a tie score at 7-7, Stanford never looked back, going on an 18-7 run to take the first set 25-14. In the second set, Ball State started strong, scoring the first three points on Stanford errors and maintaining the lead for much of the set. Despite being outhit .407 to .400, Stanford surged, and after taking a 16-15 lead, it seized control and finished the set on a kill by senior middle blocker Conrad Kaminski, his fourth of the night. Ball State kept the score close in the third set, but Stanford finished strong, going on a 13-6 run to cap off the set and the sweep. Across the match, Stanford outhit the Cardinals .465 to .221 and out-dug them 28-18. Senior outside hitter Madison Hayden hit .428 and led the team in kills. Freshman outside hitter Jordan Ewert kicked off his first college start with 3 kills and 3 digs. On Saturday, the Cardinal continued their Indiana road trip in Fort Wayne, where they won a hard-fought 3-1 victory over the IPFW Mastodons. The back-and-forth match featured 53 tie scores and 21 lead changes. The teams traded blows in the first set, and although the Mastodons kept the lead for much of it, Stanford remained close on their heels. The Cardinal claimed the lead at 20-19 and refused to relinquish it, taking the set 28-26. The score was tied 12 times over the course of the hotly contested set. Set 2 was even closer, with 17 tie scores and 6 lead changes. The Cardinal were outhit .186 to .147 but kept the game tight before finally falling 29-27. After the extended second set, the Mastodons faltered in the third, and the Cardinal were prepared to capitalize. Senior outside hitter Gabriel Vega was dominant, notching 6 kills. Stanford took a quick 3-0 lead and maintained it until the end, winning the set 25-22. The fourth and final set was the hardest-fought of them all and featured a whopping 23 tie scores and 12 lead changes before Stanford eventually took the set 28-26 on a block from senior setter James Shaw. Shaw masterfully directed the offense throughout the set, spreading out kills among Kaminski, Vega, Hayden, Ewert and junior middle Kevin Rakestraw. Stanford tallied 19 total kills in the set and outhit the Mastodons .500 to .333. Kaminski, Vega and Hayden have emerged as offensive powerhouses, with strong contributions from Ewert and Rakestraw rounding out Stanford’s attack. After a season plagued by injury, All-American James Shaw has returned to form, managing the offense and recording 30 and 49 assists against Ball State and IPFW, respectively. The Cardinal look to continue their success on the road as they face off against conference opponent Brigham Young in a two-match series in Provo, Utah next weekend.